Given the hype for the major-league debut of Julio Urias, I was prepared for a long and eventful recap. What I wasn’t prepared for, however, was this surprisingly wild game. The Dodgers mounted a four-run rally in the ninth inning against Mets closer Jeurys Familia, but came up on the wrong end of a 6-5 loss thanks to a walk-off homer by Curtis Granderson against Pedro Baez. With the loss the Dodgers fall to 25-24 overall and 12-12 away from home. 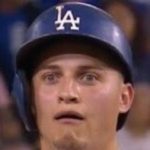 Urias made his debut today, but his command didn’t. He labored through 2.2 innings on 81 pitches, striking out three but surrendering five hits and four walks. He exited with the bases loaded having already given up three runs, and Chris Hatcher had to be brought in to escape further trouble. Hatcher himself couldn’t completely escape trouble, as he made it through 1.1 innings but gave up one hit: a solo homer. The same goes for the man who followed, Joe Blanton, who also only surrendered a single hit in his two innings, but it was unfortunately a solo blast. Louis Coleman and J.P. Howell then worked one scoreless inning a piece, but it wouldn’t matter a whole lot. The Dodgers offense was dead through eight innings, totalling just a run on four singles, three walks, and a hit-by-pitch against starter Jacob deGrom and relievers Jerry Blevins and Addison Reed. However, they rallied for four runs in the ninth off Familia, capped off by a three-run triple by Chase Utley. The Dodgers play the Mets again tomorrow, with Kenta Maeda going up against Noah Syndergaard at 4:15 PM PST/7:15 PM EST. I bet that’ll help the Dodgers offense finally get hits.